The DDR was created on October 11th 1949 with a Parliament in East Berlin and a Nationale Volksarmee whose music was provided by Berlin’s Zentrales Orchester and Stabsmusikkorps und Spielmannszug der Stadkommandantur Berlin down to 19 Musikkorps across 4 branches of East Germany’s military service. 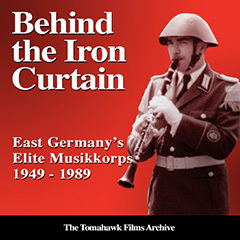 Many former Wehrmacht ‘founding fathers’ of East German military music had served under the former war-time Air Force Head of Music, Prof. Husadel and that exciting ‘Luftwaffe feel’ could still be heard in the post-war performances of the elite Berlin Volkspolizei band, the Zentrales Orchester des MdI, (Ministerium des Innern), notable for its pre-‘45 feel of a strident janissary beat with distinctive high-pitched twirls & embellishments of the woodwind section’s clarinets & piccolos! Fanfarenklänge - Im Paradeschritt, - Lied der Nationalen Volksarmee - Berlin Bleibt Rot - Fichte Marsch - Nationalhymne - Volksmarine Marsch - ‘Stasi’ Wachregiments Lied - Parademarsch Nr.1 and a secret and rather emotive live recording of the Wachregiment ‘Friedrich Engels’ changing the guard at Strausberg Barracks.